Nice wagon. I like the wagon , the only thing i dont like about the exterior of the wagons is the taillights, I just don't like something about them. I would still drive it though, maybe that's the father in me coming out in car form? Oh well I would like to see (or have) a kitted wagon. In Japan they did make cover that blocked about the top half of the tail lights. The part that are mostly non functional. i've thought about doing a front conversion to a 02-03 lancer would make it look jdm. should be able to find 02-03 body kits that would fit especially with the rear liscence plate being on the bumper. headache would be top area where the rear lift door is, it must be modified. 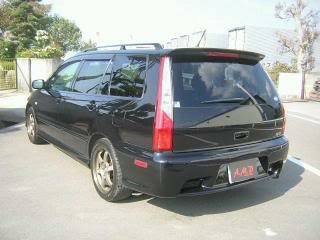 also US lancer bumper stick out like a ghetto butty while jdm is kinda flat with no butty! The Wagon is much more popular in Japan and Europe. There are some kits like Ken Style that are made for the wagon. I emailed kenstyle they want $710 USD for the wing and rear bumper spoiler does not fit US wagons! Last edited by azt021; Mar 23, 2009 at 10:18 PM. this kit looks great i love it!! i like the back the most! Maybe it would with modification. Companies like that will sometimes say no to protect their reps since they haven't personally tried it yet on a US car, but a lot of JDM parts require tweaking. Wait a minute. The JDM Rear bumpers stick out a couple inches, the U.S. Models stick out like 5 or 6 inches. If it is a lip only then you would have to get a stock bumper from Japan to fit the lip. I was thinking it was a full rear bumper. pakfiefer has a full bumper, I've seen some more I'll 1st them as a remember or see them. try searching under Cedia as the model also. 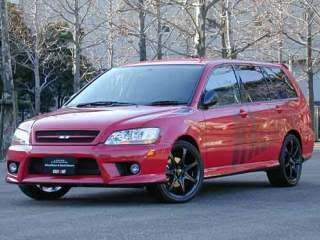 On the other hand The difference between a lancer and a lancer wagon is how they fit on the top edge. As far as I know (some please confirm) a some U.S. rear lips should fit all U.S. models. The location of the license Plate becomes the only issue. Your plate is on the rear bumper. Some year Lancer are up in the trunk lid. if the lip came up to far there might be an issue. P.S. I found a supplier that is willing to get used Cedia Ralliart body parts! Not cheap but not that out of line with good body kits. would be great especially body parts for the wagon. let us know what parts he is able to get maybe some modification to make them fit! and if he is able to get the wing cheaper than $710 would be great! He thinks he can get the Cedia Wagon Ralliart read bumper and send it here for about $850. Half of that cost is LA Port fees!!! He is still looking into the rear wing that came on The Cedia Wagon or the one on the Evolution wagon. I've joked that I'm mostly interested in modifing the rear end cause on the road that's what most other drivers see. P.S. I finally updated the info on my Sportback in the registry. It's nice to see a few Northeast Ohio guys on here. I'm picking up a yellow Sportback Ralliart very soon. It's a bank-to bank payoff, so it takes a bit of time, but at least the seller's bank has the check! Now, I'm just awaiting a payoff letter. Hopefully the slow *** bishes at the USPS give me a break. I'm dying to get the car! ...and I don't want to hear any cracks about the fact that it's a wagon. I gots kids...gotta be realistic. TheGreek, the one who bashes on me is my wife. She hates the wagon but loves to drive it. She is about 4 mnths Pregnant so soon I will know what is to drive my kid(s) around. Once your in it, you will enjoy it especially the buzzing sound that comes from the exhaust. Too bad there are non with manual trannys. I still enjoy mine and every night I'm out and about I do not want to return home. Good luck on your purchase! The truth is they are just envious. You've got the rarest Lancer in the U.S.! The Sportback is a fun sporty car. Much more so than any SUV or Mini Van. I came from driving mostly sports cars and small cars. I love mine. It's a lot of fun to throw around in the curves and has a good amount of power. It may not be the fastest or the most manuverable car ever but it is a blast to drive and squeal the tires on. My wifes new Outlander has the semi-automanic with the paddle shifter; that or the manual would be nice. A sunroof would have been a nice option also. The factory rear wing begs the question why isn't it on the Rallliart or an option. But you can always find something; that's why cars get modified in the first place. Last edited by truthdweller; Oct 9, 2012 at 06:15 AM. Ok truth it's about time to chill with post whoring you car pics. Make a single thread in the show and shine section about your car. Add to it when you make real changes , not photoshops. I didn't want to have to say this but you keep posting the same picture again and again and again its gotten old.